Browse: Home / adpwn – tools for Windows Active-Directory explotaition and pwning. ADPWN is a Useful tools for Windows AD explotaition and pwning. 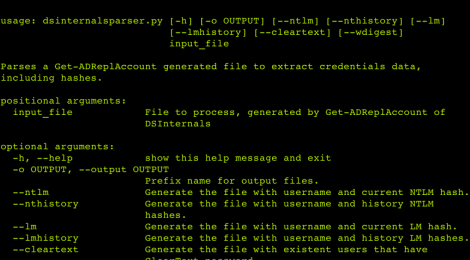 dsinternalsparser.py This tool makes easy and faster the dumping process of hashes stored in a domain controller. * It uses the output of the DSInternals modules that retreives reversibly encrypted plaintext passwords, password hashes and Kerberos keys of all user accounts from domain controllers. * As mentioned in DSInternals web page(https://www.dsinternals.com/en/), it is possible to retrieve hashes remotely, instead of the well known method using vssadmin, ESEDBTOOLS and NTDSXtract, pretty slow in some cases because of the NTDS.dit size, ESEDBTOOLS misconfigurations, etc. – DSInternals output file generated with Get-ADReplAccount or Get-ADDBAccount. 1. Retrieve all users attributes with the DSinternals module Get-ADReplAccount, and save it to a local file. The file generated has a format similar to the next one. 3. 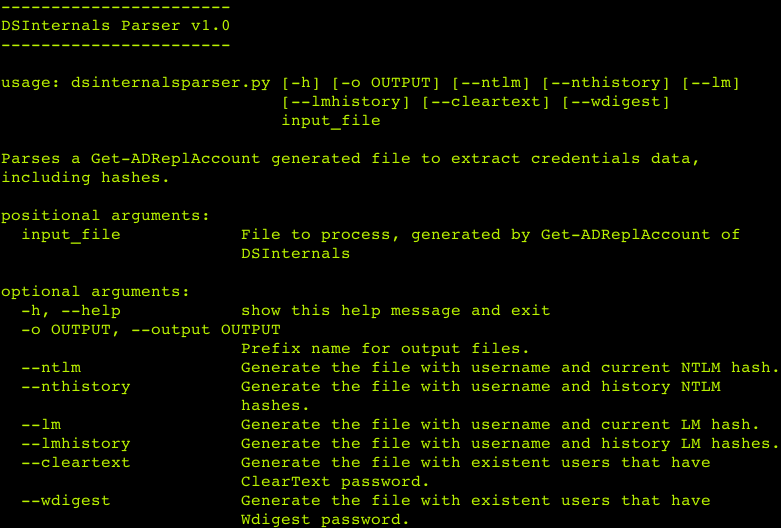 After execution, if no options are given, dsinternalsparser.py creates 6 files. – NTLM File (dump_ntlm.txt): Contains username and current NTLM Hash. – NTLM History File (dump_ntlm_history.txt): Contains username and NTLM History Hashes. – LM File (dump_lm.txt): Contains username and current LM Hash. – Cleartext File (dump_cleartext.txt): Contains username and Cleartext password, if exists. – NTLM History File (dump_wdigest.txt): Contains username and WDigest history Hashes. ← Leviathan – wide range mass audit toolkit.